I was scheduled for another MRI today. I have to say that it was a much more pleasant experience than the last MRI in June, prior to my 2nd surgery. I arrived prepared, with no metal on my body whatsoever. Thereby alleviating the need to render myself naked under a thin dressing gown, which never completely closes in the back. I’m guessing the need to do a full cavity body search for undetected metal is so that my MRI would not be like leaving, say, a fork in the microwave, and then turning it on full blast. I’ve never done that. But I can’t imagine it would be pretty. Therefore I left all jewelry and underwire bras at home. The other benefit to being able to leave my clothes on during the MRI, is that the MRI is housed in a meat locker. I’m not even kidding when I tell you that the temperature dropped 40 degrees when I entered the room. I don’t know how they can expect you to lay still when your teeth are chattering, and your lower extremities begin convulsing uncontrollably. Anyhoo, the MRI technician was a sweetheart that arranged pillows in all the spots that needed padding, and she even provided me WITH A WARM BLANKET. And this time, I was given headphones that actually worked and could drown out the unpleasant MRI noises, which have a side affect of making me think that I’m crazy. Therefore, the MRI experience was not at all unpleasant. However, talking to the MRI reader/technician/doctor/guy about my results afterwards, was. He basically told me that my ACL (which was completely intact just prior to my last surgery) is GONE. Plus a bunch of other stuff that if stated simply, implied that my knee IS A HOT MESS. I cried the entire way home. I talked with my Physical Therapist on the phone later, and he talked me down off of the building, telling me NOT TO PANIC until I see my Orthopedic Surgeon on Friday morning. My doctor has been out of town, and I saw his assistant last week who concurred that I’m not healing. He ordered blood work, the new MRI, and has me on Prednisone for 10 days. He also gave me a new pain killer that will not contribute to me being sentenced to Betty Ford for detox. Evidently I’m some sort of freakish anomaly, and no one really knows what’s going on with my knee. In an effort to “think outside the box” they are even sending me to see a Rheumatologist at the end of the month. I am extremely doubtful that Rheumatoid Arthritis is behind all of this. But I’m covering all the bases. We’re even looking into a trip up to the Mayo Clinic in Jacksonville. I’m hopeful that I’ll have more answers on Friday when all the various tests are put together. But honestly, hope is getting harder to come by. And then, to top it all off, I’m experiencing hot flashes AND MENSTRUAL CRAMPS. But I can’t take my beloved Motrin because of the Prednisone. OH, I AM A BARREL OF FUN TO BE AROUND RIGHT NOW. Anyhoo, I’m looking for joy where ever I can. And I’ve found two little things that have been brightening my spirits. This is the first one. 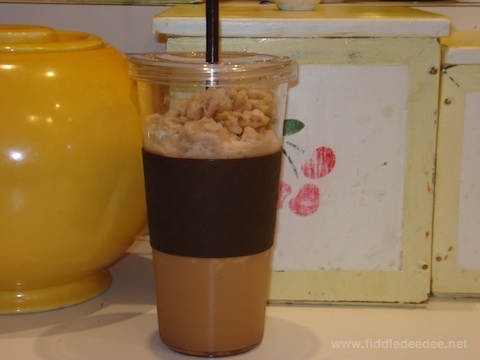 Fiddledaddy got it for me at Bed, Bath, & Beyond for my daily homemade blended coffee drink. Now I can truly have the Starbucks experience, without spending a small fortune. And this cup, lid, and handy straw are all dishwasher safe. Secondly, my bloggy friend, Tanya M., knowing my deep and abiding love of Ritz Crackers and Girl Scout Thin Mint cookies, sent me this link. 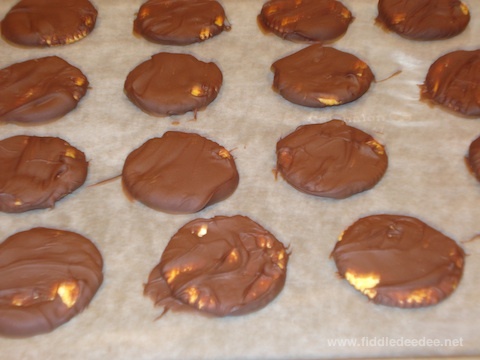 It’s a super duper easy recipe for homemade Thin Mints. I tried them, and THEY ARE WONDERFUL. Of course, mine didn’t turn out as pretty as the one pictured on the link. BUT WHO CARES? They are bringing me joy. I’m keeping my head up (mostly so I don’t trip over my crutches) and trusting that God has a plan in all of this. As always, thank you for checking on me and for your continued prayers! Have a terrific week, y’all. DeeDee, I’m sure you’ve been inundated with advice, so I’ll keep this brief. Before I let anyone cut on my knee again, I would get myself to the nearest BIG teaching hospital. In my neck of the woods, that would be Johns Hopkins (it’s 3 hours away) or University of Virginia Medical Center. That’s where you’ll find the best of the best. Seriously, we have experience with the orthopedic departments in both of these, and they have just been the best, disagreeing with our local advice and being right both times. Well, PHOOEY. I’m glad you’re surrounded by supportive folks, and I hope you can get some answers of the “where-do-we-go-from-here” variety very soon. Also: that coffee drink and those thin mint thingies look fantastic!! Hi, wow girl, I would have to agree with Karen. I am so sorry you are going through all of this. As always, prayers. And as for Jensen’s artwork?, magnificent! Five!? If Mayo sends you to their MN branch please be sure to let me know! I’d be happy to take you out for a blended coffee drink! I am so sorry DeeDee to hear your knee is still not healing. I agree with Karen; the Mayo Clinic or something similar sounds like a great idea. Sending prayers up for you! I too am so sorry about your knee. What a terrible way to spend your summer so have a good cry, a great cold drink (I’ll leave it to you as to what) and lots of chocolate! God has a plan, He will make it clear to you what that plan is. Aren’t the Girl Scout cookies wonderful? It looks to me like you just need to thin the chocolate out with a little more Crisco (don’t use butter – the chocolate will get funky!). I will be praying that your knee heals! Praying for you, and the doctor that will be treating you. Thanks for sharing that recipe I may just have to try it! I wish I had some words of wisdom, but I don’t. Just offering my support as a blog fan! Well, at least you can can joy in the fact that you can still multi-task, what with the menopausal hot flashes and the whole knee thing going on at the same time. No sense dragging that out into 2 separate agonies. I’m kidding, of course. We’ll keep praying. Hang in there! I second that invite if you get sent up to Mayo in Minnesota. My parents have spent the last few years “entertaining” loved ones who have needed their services. I’d be proud to continue in that tradition. And I bet I could figure out a way to turn ChocoVine into a frozen coffee drink . . .
Prayers said for your healing. I’ll be praying for you DeeDee. I will chime in and agree with Karen and the others too. Sounds like a pair of fresh eyes would do you some good. I’m sorry about this whole knee thing you’ve got going on. I can only imagine the frustration…. You do realize you hit the nail on the head when you said that God will work this out. So many times in my life I’ve faced (sometimes painful) obstacles and I wondered why? why me? Sometimes God shows me the why…and sometimes not. I just have to trust Him because I can’t see what He is doing. Praying, DeeDee! Hang in there. God really does know what He is doing. It just doesn’t look like it from our side of the veil! No advice here … just lots of prayers! I am so sorry for you. I can no longer get on my knees to pray or do anything else (like floors!) so I often sign off, “In my heart, I’m on my knees.” You’ll have to do the same. I say, “Yes, Lord” to the trusting in His plan, and also ask that the calories in those little pieces of chocolate heaven will not count for you. Press on, Dee Dee. DeeDee, I share your frustration with a knee surgery that is not working as expected. I am praying for you to get some answers next Friday and for your complete healing. Thanks to you I located the ChocoVine at my local Publix today. I’m so sorry all of this has been happening. I know we don’t know each other but I’m sending you many prayers and hugs and I hope your appt. with the Mayo Clinic will be fruitful. Rely on God and He will get you through. I understand your pain. Literally. I fell at the pool almost 2 weeks ago and hyperflexed my knee. It seems I’ve done some damage to it and will have to go back to the doctor soon.